Well, think we did. The giveaway was meant to make it easy for the koolaman team to make a decision on the name of our new pendant. The overwhelming response to the giveaway with hundreds of suggestions meant that we had plenty of names to choose from. There was a varied response, with lots of Mums suggesting their children's names, names inspired by friends or special people, phrases, some humour, some suggestions of beautiful names already in the collection and we even received a poem. We've selected the name with thanks to Brooke. Brooke suggested PENNY(the pendant) is round and penny shaped (even though there is no middle) and its just a pretty and simple name that fits with your other pendants.... We debated about PENELOPE as there were a few suggestions for this beautiful name too however we decided on PENNY. We all agreed, PENNY certainly fitted with our koolaman designs silver collection and we think it's a fitting name for our new pendant. We'd like to thank everyone who sent through their ideas, we were amazed by how many of you there were and we certainly appreciated your efforts. Here are a few of the interesting replies we received. And just like children, none are the same! So a unisex name is guaranteed not to fail! Instead I have decided to play your game. But in the end, I settled on "Charli(e)". 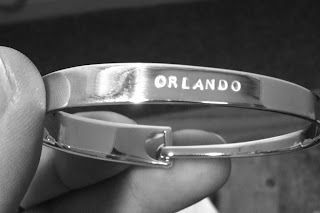 What a lovely name for a girl or a boy! Of pendants, tags, chains and other selections! My suggestion is May! It is the month of May...Mother's Day! 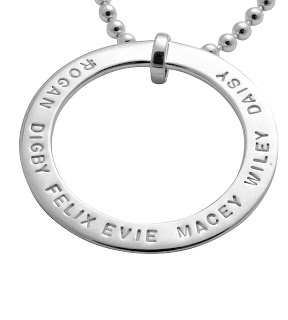 It is also the name of my first child of four I could fit all my children's names on this pendant! May Margaret, Samuel Alan, Max Bernard and Thomas John Kent!!! I think it should be called Fiona - cos it's big and round just like me!! Ethel Turner wrote the australian classic, Seven Little Australians. This pendant is just the thing needed for mums with thier own seven little australians, therefore I suggest ETHEL. PENNY is now available at our online store and at fairs and expos leading up to Christmas. Don't forget if you're need a Christmas gift for yourself or someone else, order by midnight 8th December if you live in WA, SA, QLD, NT or midnight 12th December VIC, SA, NSW, ACT, and TAS. Orders placed after this date may not reach their destination for Christmas. 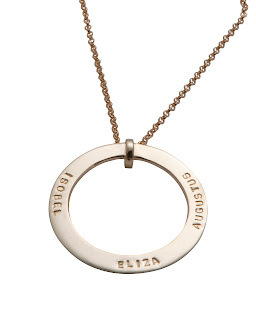 Well it's not entirely new, it's our beloved MIA pendant, you know the silver circle necklace worn by Johannah Griggs on Better Homes and Garden. It's been with us since we started and is one of our signature pendants. Lots of our customers loved it but didn't have enough room to fit their entire family. 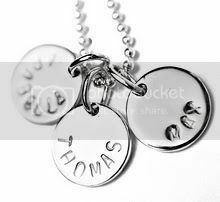 Now, we've decided to introduce it using a smaller font as well, which means up to 46 characters can fit around the pendant. Perfect personalised gift for Grandmas and Nanna's. Or someone with a large family! You can win your very own, simply tell us which name you'd like to call it and why. The pendant is valued at $250. Leave a comment on the blog and your details or under the image on facebook. 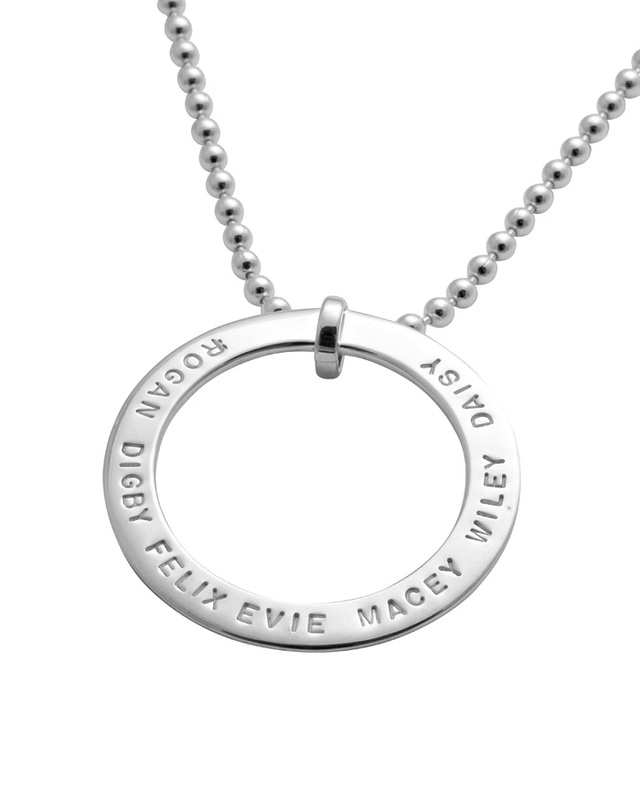 Winners announced on Monday 21st November 8pm and the pendant is released for sale on Tuesday 22nd at 9am. Out and About! 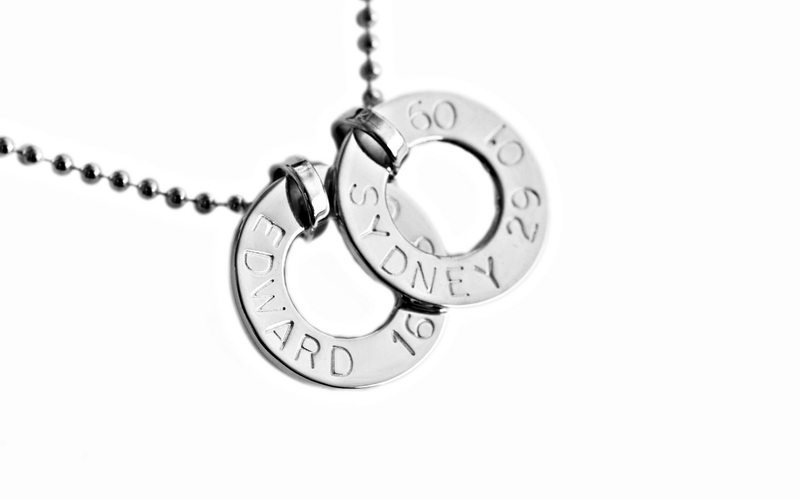 We're embarking on a very big weekend travelling all over visiting some beautiful places, Toowoomba, QLD, Tamworth NSW, Hamilton VIC, Brisbane QLD and Geelong VIC to exhibit our koolaman designs personalised jewellery range. The koolaman team is spreading out and our Mum (affectionately known as Mama) has jumped on board to help us. It all starts at Toowoomba Bush Christmas. The Bush Christmas started 14 years ago as a way to showcase talent in outback QLD and NSW. We've been fortunate enough to be accepted into the exhibition this year. The exhibition is open from 18th - 27th and Mama (Lisa and Stacey's Mum) and Stacey co founder of koolaman designs will be there on Friday, Saturday and Sunday. Entry is gold coin donation. We've had some great coverage from Lee and Lizzy at 3GR and they are giving away a koolaman designs Audrey pendant and William personalised cufflinks this week. If you're a Toowoomba local tune into 3GR and check out their facebook page for the "koolaman kodewords" and you kould win one yourself! Recent display at the Henty Machinery Field Days with Kristie (koolaman customer service) and Mama (jack of all trades). Our final Brisbane Mathilda's Market for 2011 will be a huge Christmas extravaganza held at Eagle Farm Racing Club. Tess will be there and can take your Christmas orders. It's all under cover and rain hail or shine the show will go on. Then it's down to Tamworth to the Brain Foundation Christmas Fair, held at the Tamworth Racecourse we'll be exhibiting Saturday 19th November 9.30 - 4pm. This is our first time taking koolaman designs to Tamworth and I'm sure it's going to be a lot of fun! Look out for Stacey who will be taking orders. Much further south we'll also be down to Hamilton to the Three French Hens at the Hamilton Racecourse. We had a great time last year purchasing some lovely christmas gifts, beer and proteas. Can't wait to see what they've got in store for us this year. The fair goes for two days Friday 18th and Saturday 19th 10am - 4pm.. koolaman designs will be exhibiting SATURDAY ONLY and Lisa will be able to take orders. Sunday is the final Piccadilly Market for 2011. 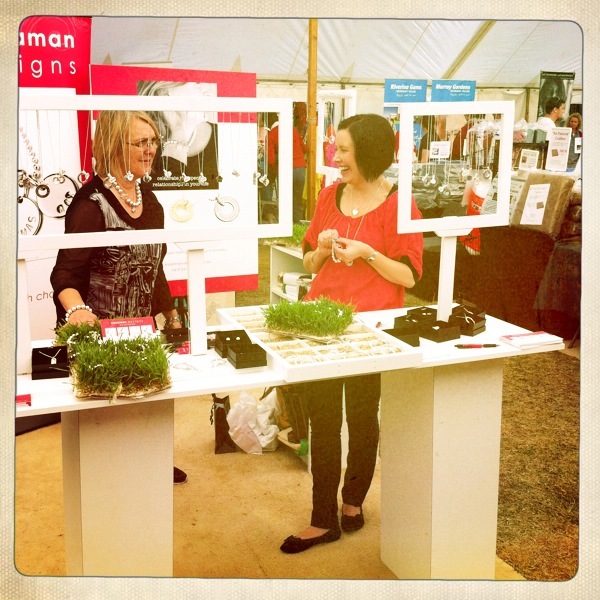 We've really enjoyed exhibiting here at this Geelong Market. Visit Janina's blog to see all of the stall holders and their beautiful wares. Just remember any orders placed at the fairs will be sent to you free of charge saving $15 postage fee. See you there!